We have a range of Citrine, Hematite, Blue Chalcedony, Prasiolite, Labrodorite, Quartz Crystal. Order online at our website or visit our Rockchic shop in Hout Bay. 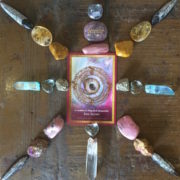 Just for the Moment Joy grid made from gemstones, chosen spiritual card and crystals at the entrance of Rockchic Shop. Every week we make a new grid. These grids are an incredibly powerful energy tool to use when manifesting your desires. Word stones Harmony and Peace with Malachite, Kyanite, Ammonites, Angel Aura, Carnelian arrows, Lapis, Pyrite rough and Olive Opal hearts. All items available at Rockchic. Rockchic’s gemstone massage wands are used as healing crystals. These polished crystal wands can be used to massage the skin bringing crystal healing. 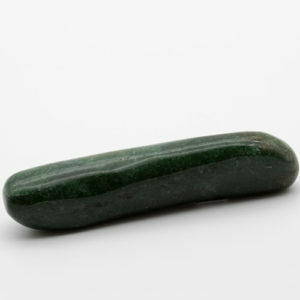 They can be laid on the chakras or body in need of healing or used to focus healing energy. Fuchsite fits perfectly in your hand and is wonderfully tactile and soothing. Fuchsite is known as the stone of health and can help to channel information regarding herbal treatment and holistic remedies. 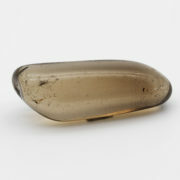 It suggests the most holistic remedy to take and guides you on health matters and well being. Fuchsia can also help one bounce back after emotional or physical problems. It is said to speed deep healing by assisting with recovery and immunity. 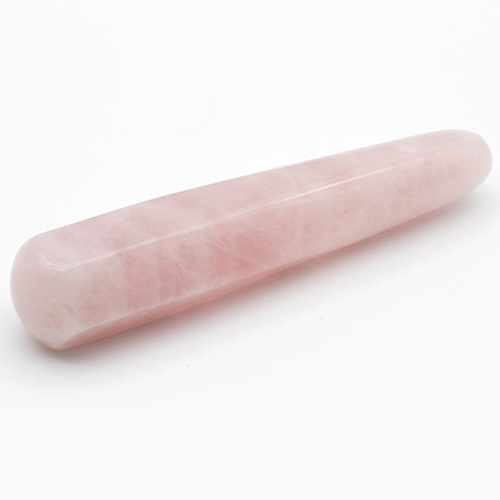 Visit Rockchic in Hout Bay or shop online to see our Rose Quartz, Lepidolite, Sodalite, Moss Age and Fuchsite Massage Wands. 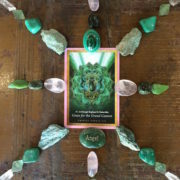 Rare Success grid made from gemstones, chosen spiritual card and crystals at the entrance of Rockchic Shop. Every week we make a new grid. 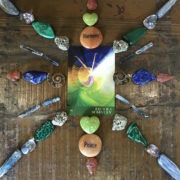 These grids are an incredibly powerful energy tool to use when manifesting your desires, goals and intentions. This grid contains aqua aura, citrine, yellow jasper, pyrite, blue obsidian, chalcopyrite, rhodonite, quartz crystal, mookite and orthoros for North, South, East and West. This fossil is used to stimulate the mind by assisting in reducing tiredness and strengthening the root chakra. They stimulate life force energy in the body. 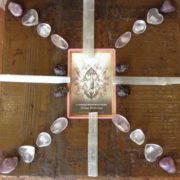 Divine Perfection grid made from gemstones, chosen spiritual card and crystals at the entrance of Rockchic Shop. Every week we make a new grid. These grids are an incredibly powerful energy tool to use when manifesting your desires, goals and intentions. 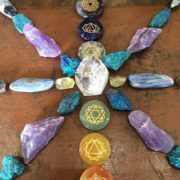 The power of a crystal grid comes from the combination of energies created between the healing properties of crystal, the patterns in sacred geometry and your intention. This focused intention to manifest brings protection, abundance and peace into our sacred space. Black Tourmaline have the ability to absorb electromagnetic pollution (radiation from cellphones, laptops, microwaves, tv). They put out pure, clean energy. Wearing Black Tourmaline, Shungite, Obsidian, Smoky Quartz and Jet around your neck or as a bracelet protects you against electromagnetic emanations, including cellphones and computers. Smoky Quartz crystals have a practical cleansing purpose. Place one between you and a source of electromagnetic smog or geopathic stress or position it on your desk. An Amethyst geode has the same effect. Place a Fluorite cluster or a piece of Lepidolite beside it, and you will be amazed at the difference in how you feel. Wifi radiation alters human DNA with constant exposure over time leading to dehibilitating effects: tiredness, depression and finally dis-ease. Minimize wifi by switching off cellphones and tv especially at night when your body sleeps and refreshes. Walk in nature in silent without being wired-up to music especially as your ears feed frequencies directly to the brain, run on the treadmill without answering calls or checking wats up, eat dinner with all cellphones and TV’s switched off. Get up from your desk after 40 minutes and sit in the sun for a dose of Vitamin D – excellent for counteracting electromagnetic pollution. Working from devices that are connected to cable or telephone line further eliminates wifi pollution. Shungite Pyramids and Organites are also excellent. See information on these electromagnetic vacuums on the crystal page of Rockchic website.